A while back I wrote a post called What Each Myers-Briggs® Personality Type is Like as a Mom. After writing it I had a lot of requests for an article for dads. I had already had the idea simmering around in my head for a while, but I wondered…is there really much difference between moms and dads and their parenting styles? So I decided to ask around, research, and study. Fathers and mothers tend to have different struggles when it comes to parenting. There are a lot of gender roles and traditions and expectations that are placed upon mothers and fathers, and these differences place different pressures on them. For example, the traditional mother role is that of a sensing-feeling-judging type. The traditional father role tends to be that of a sensing-thinking-judging type. As a result, thinking mothers sometimes feel that they’ve got to conform to a more SF role whereas thinking fathers often aren’t concerned because tradition has led them to believe that this is the typical male model that they’re following. Feeling fathers often feel they have to develop a more thinking-style role, however. Thinking mothers and feeling fathers tend to develop their opposite preference during parenthood to a certain extent, often because they are infiltrated with the idea that the opposite preference (feeling for moms and thinking for dads) is the norm. Keep in mind, this is all general feedback and tends to be the case, but it isn’t necessarily true for every single father. Each individual and parent is unique. There are also different struggles in the introversion/extroversion area. Introverted moms, because of expectations placed on them by society, often give up their alone time to nurture, give, and tend to the needs of their children. Introverted dads are more likely to meet their needs for solitude and not feel as much pressure to constantly parent and tend to their children. Thus, introverted moms, as a general rule, tend to be more energy-depleted than introverted dads. To help you determine what your (or your partners) strengths are as a parent, let’s take a look at what each one is like. Not sure what your personality type is? Find out with the most accurate free online test here. ISTJ fathers enjoy quietly watching and observing their children and noticing all the little details that make them unique. They may not always talk about their observations, but they store them away in their mind to reflect on later. They tend to take their responsibilities very seriously, and this often comes through in their work ethic. They believe in working hard, being responsible, reliable, and consistent to make sure that their children are provided for. Sometimes they struggle with the transition from work life to family life at the end of the day, and they will usually need some quiet time to wind down after getting home from work. Often in their efforts to spend time with family and meet their need for solitude ISTJs shed superficial relationships or friendships. Many ISTJ fathers feel that their family becomes their entire social world and that they can’t make time for outside friendships. When it comes to interaction with the children, ISTJs enjoy teaching them and watching them learn and become independent. They especially enjoy teaching them about topics they’ve mastered and know a great deal about. They may not be very verbally or physically demonstrative parents, but they have very deep, strong feelings for their children and will support them and show their love by consistent loyalty and care. They tend to be very consistent and somewhat strict with discipline. They don’t really enjoy disciplining, but they believe it’s important to shape inward character. ISFJ fathers believe in having a quiet, yet intimate relationship with their children. They enjoy observing their children and noticing all their unique traits and strengths. At the end of the day, they enjoy reflecting on all their favorite memories of the things their children did. They try to be open with their feelings towards their children in hopes that their children will feel comfortable doing the same. They want their children to feel confident that they can talk to them about anything at all. ISFJ fathers do tend to struggle with balancing home and work life. As introverts, they often feel worn out after a day surrounded by people at work. They will usually enjoy a small amount of time with their children when they get home, and then they’ll retreat for a while to recoup their energy on their own before joining back into family interaction. With their kids they are compassionate, open, and eager to build rapport and trust. They tend to be consistent, structured, and enjoy creating family routines like having “family time” at a set hour every night. They can struggle with giving discipline because they dislike criticizing or causing their children any kind of sadness. They can also get frustrated with this side of themselves and go overboard and be overly strict and demanding. They often face an internal struggle with this aspect of parenting and may waver between two extremes. Some ISFJ dads learn to find a happy balance and manage to give consistent, yet loving discipline. Overall, ISFJ fathers are excellent at caring for their children’s practical needs and wonderful at providing stability, security, and affection. They will be on time for games, demonstrate their love, and be a trusted source of loyalty and strength. ESTJ fathers are usually interactive, consistent, reliable, and logical. They love teaching their children and finding practical, hands-on activities they can do with them. They may struggle with switching gears when they come home from work and may need a little time to unwind and do their own thing before playing with the kids or taking part in family activities. They see every outing as an opportunity for education and they like to show their love by teaching, being on time for events, and providing for their children. They take their family’s financial needs very seriously and usually have a very strong work ethic. When it comes to engaging with the children, ESTJs like to do hands-on activities like playing ball, bowling, or teaching them a new skill. With discipline, they are usually consistent and somewhat strict. They see things in a very black-and-white way and don’t tend to struggle with considering various “shades of gray” when doling out punishment. They believe discipline is an important part of shaping character and teaching children to be responsible for their actions. Overall, ESTJ dads love watching their children grow, learn, and become independent. They enjoy helping them meet their goals and do well academically. They provide their children with a stable support system and loyalty that will serve them well their entire lives. ESFJ fathers are usually sensitive, considerate, consistent, and loyal. They believe in being honest and open with their children, hoping that in return their children will feel comfortable coming to them with their thoughts and concerns. They are very conscientious of their children’s feelings and enjoy one-on-one conversations and family outings and activities. They enjoy active, energetic games like hide-and-seek, tickling, and getting everyone excited and laughing. They are at their happiest when there is harmony in the home and when they feel everyone is getting along. ESFJ dads can struggle with balancing home and work life. They often feel over-extended and unable to “unplug” from work and commitments and the needs of their families. Sometimes this can result in stress and frustration for them, and they may become uncharacteristically withdrawn or aloof. This usually doesn’t last long, however, as they like to be involved with their kids and engaged with their family regularly. ESFJ dads are usually are relatively consistent with discipline, but it can drain them and depress them afterwards. They like having a certain amount of control in their home and with their children, and can feel flustered when their children don’t respect their authority or find ways around rules. Overall, ESFJ dads are active, engaged, and empathetic with their children. They provide them with consistency, affection, and dedication that comforts them through life. ISTP fathers are known for being non-intrusive, easy-going, and playful. They enjoy seeing their children become independent, unique individuals without exerting a lot of influence over their choices and plans. They enjoy intellectual discussions and teaching their children new things. They enjoy getting involved with them through sports, silly play (like tickling, chase, or wrestling), and teaching. ISTP dads are usually independent, somewhat reserved, yet laid-back. They need a lot of alone time and will often retreat to their room after a long day at work so that they can unwind before interacting with their kids. ISTP dads can struggle with showing their feelings towards their children. They usually consider their feelings self-evident through their actions and support. They may be unsure what to do during emotionally charged situations, and they may back off or else provide logical solutions which only frustrate their children further. If they can find ways to communicate with their children consistently, then everyone will be much happier. One ISTP dad I spoke with did this by creating a “code word” with his children that they would use when they wanted to have an intimate chat. Another dad would write little silly but affectionate notes to his children and slide them under their doors at night. Overall, ISTP dads are open-minded, adventurous, and skilled at showing their children how to experience and understand the world around them. They provide them with logical instruction, respect, and flexibility to create their own unique identities. ISFP fathers are usually gentle, empathetic, and playful. They enjoy showing their children the beauty and adventure in life, and will love connecting over quiet walks in the woods, silly tickle wars on the living room floor, or evenings fishing at their favorite pond. They need alone time, and after some warm cuddles and hugs, they may retreat to their room after work to wind down and energize before interacting with family. They are usually flexible parents who are interested in seeing each child as a unique individual with their own unique path in life. They don’t like to control their children or set boundaries around them, and instead prefer to see where each child goes and provide some safety precautions along the way. ISFP dads enjoy being spontaneous with their families. They will feel frustrated if life is very structured or there are a lot of social obligations. They want to have the free time to engage and find activities when the mood strikes them. They are usually accepting of their children and like to make things fun with hands-on, interactive play. One of their greatest skills is just being there for their children in the moment; not pressuring them to speak or interact, but just being there and being willing to listen, play, or quietly support them when it’s needed. Overall, ISFP dads are open-minded, fun-loving, and quietly supportive. They provide a gentle strength to the family and a loving acceptance that makes children feel at home and understood and appreciated. ESTP dads are adventurous, fun-loving, and open-minded parents who are usually well-loved by their children. They like to be spontaneous, flexible, and free to create fun opportunities and activities whenever the mood strikes them. They are happiest when their kids talk openly and are having a good time; they enjoy active, energetic games like sports, wrestling, chase, or tickling. They usually enjoy getting their kids gifts randomly and taking them on adventures they won’t forget. When it comes to communication, ESTP dads are direct, logical, and usually a mixture of blunt and charming. They tell it like it is, but they also are more aware of the feelings of others as they enter mid-life. As a result, they can waver between being blunt and tactful, depending on the situation. They really enjoy seeing their children be independent, take healthy risks, and share their own unique points of view. They can struggle with spending time on the nitty-gritty, repetitive work involved in parenting. Things like mundane homework, chores, and a daily routine can be frustrating for them and make them feel stifled or trapped. They like variety, flexibility, and freedom and will need to have regular segments of time to go out and do their own thing. Overall, ESTP dads are adventurous, fun-loving, and exciting. They give kids confidence and independence to achieve their own unique goals and dreams. ESFP dads are enthusiastic, affectionate, and flexible with their children. They like to engage with them in the moment and show them beautiful opportunities that can be had right now. They are usually talkative and enjoy conversing with their children, sharing their feelings, and being silly and laughing together. They love active, energetic games like hide-and-seek, tag, tickling, wrestling, or playing sports. They also tend to be fantastic gift-givers who enjoy splurging on items that would pique their child’s interest. They like to devote a lot of time to their children, but they also like having time for their own adventures and experiences. They are very realistic, down-to-earth parents and make their children feel comfortable talking about anything. ESFP dads struggle most when they have to focus on the mundane, rote aspects of parenting. Plodding through repetitive homework, dishing out discipline, and cleaning up house day after day can feel stifling and boring to them. They may put off these things for too long and then regret it later. They also don’t tend to make a whole lot of rules for their kids to follow – but they have very strong values about things like honesty, kindness, and compassion. When their children are outright mean or dishonest this can make them crack down in a way that surprises even them. Sometimes ESFP dads worry about being too flexible. They may find themselves negotiating with their children more than they’d like and struggling to set some hard and fast rules in place. Overall, ESFP dads are interactive, fun-loving, and open-minded. They help kids to find the joy in everyday moments and face life with compassion and enthusiasm. INTJ dads are intellectual, responsible, and usually excellent teachers. They may need a lot of alone time, but when they actively engage with their children they are imaginative, innovative, and insightful. They like to teach and get a real thrill from seeing opportunities for learning. They especially want their children to be independent and capable of handling whatever life throws at them; they help them with this by giving them opportunities to prove and challenge themselves without hovering or micro-managing them. INTJ dads aren’t always the most demonstrative parents, but they try to show their love through action rather than words. Providing for their children, being loyal to them, and listening to them are all ways that they show they care. They may get frustrated with especially emotionally-charged moments in parenting. If they can remember to give criticism gently and provide affirmation when possible, they can get through the ups and downs of parenting much easier. Many INTJ dads have a hard time switching gears after work. They will usually need some alone time to recharge before interacting with their kids, and they may feel overwhelmed with the noise and commotion of parenthood. It’s important for them to get regular spurts of alone time and to combine that with loving, one-on-one interaction with their children. Sometimes writing little notes of affection and leaving those for their children at night can help them to build a bond even during those quiet moments. Some INTJ dads also like to journal with their children, leaving little notes throughout the day for each other. Overall, INTJ dads are dedicated, loyal, and attentive to their children. They help their kids focus on the big picture, see hidden perspectives, and use their imagination. With an INTJ parent many children feel they have a broader understanding of life and a confidence in their dreams and ambitions. INFJ fathers are insightful, empathetic, and imaginative. They are happiest when they’re able to bond with their children over shared dreams, ideas, and possibilities. They love discovering what’s happening in their children’s minds and helping them achieve their goals and believe in themselves. They are usually open with their feelings towards their children, and very affectionate and reassuring. They want more than anything for their children to feel they can talk to them about anything. They devote a lot of time to their children, but they also try to get alone time so that they can recharge after being at work or around people for long. During these times they will either go to their room or sit quietly in the background and just observe their children playing or read a book. INFJ dads take providing for their children very seriously and try to show a brave, steady face to their families so that their children will feel secure. They may struggle with switching gears after work and getting into “dad” mode right away. They need more transition time than many other types to move from one mode of mental energy to another. With discipline, INFJ dads can struggle. They tend to empathize with their children a lot and can get stuck negotiating and renegotiating with their children instead of laying down hard and fast rules. This can frustrate them and they can have moments of losing their temper and being overly strict to make up for the times that they are lenient. Many INFJ dads eventually learn to balance consistent discipline with expressions of empathy, but this can be a struggle for them. Overall, INFJ dads are warm, nurturing, and imaginative parents. They help their children see numerous perspectives and believe in their dreams and the power and beauty of the future. ENTJ fathers are excellent at instilling confidence and independence in their children. They believe that nothing can be achieved without hard-work, ambition, and imagination and they promote these virtues in the home. They like to give their kids plenty of opportunities to challenge themselves, work independently, and go after their goals. They are direct and logical parents, they pride themselves on telling-it-like-it-is and not beating around the bush. Sometimes they can be overly-direct with their children and come across as insensitive. It’s important for them to provide affirmation and to be gentle in criticism so they don’t hurt their children’s feelings. Learning about the personality types of their children can help them a lot in this regard. ENTJ dads enjoy making time to pursue their children’s dreams and ambitions. They’re usually good at helping with homework, making plans for a lemonade stand, or discussing their imaginative viewpoints and ponderings. They are usually good teachers and see every experience as a potential learning opportunity. They believe that everyone should work hard, be responsible, and carry their weight. They believe in being strong and steady and they will crack down hard on laziness, dawdling, or whining. Sometimes this can be a struggle for them because they care very deeply for their children, but don’t show it in the traditional ways. They believe that by setting their children up for a successful life they are showing love. They are less interested in emotional expressions, but their love is still very deep and constant. Overall, ENTJ fathers instill a strong work ethic and a grasp of the big picture in their children. They help them to see the potential of their dreams and encourage them to work hard to achieve their goals. They will be a loyal, strong force in their child’s life and this alone is an incredible gift. ENFJ fathers have a skill for empathizing with their children and making them feel heard, understood, and affirmed. They are good at broadening their child’s imagination and helping them to think outside the box and see the big picture. They are usually visionary parents who can help their children plan for the future, think ahead, and see potential outcomes. They are also very in tune with the emotions of their children, innately knowing many times when one of them is stressed, anxious, sad, or angry. They like to be interactive with their children; having conversations, reading books together, or going out and exploring the world around them. When it comes to discipline, many ENFJ dads struggle because they empathize so strongly with their children and can have a hard time being strict or stern. They do like to have order in their home, though, and will usually be relatively consistent. They work best when they can come up with a list of agreed-upon rules with their children and consequences, so that they don’t have to make up their minds at the spur of the moment. ENFJ dads are usually good providers and take their children’s needs very seriously. They can get bored with the nitty-gritty details of parenting though. Paying attention to details, taking care of the house, or keeping up with practical matters can feel tiring over time. Overall, ENFJ fathers make their children feel appreciated, seen, and listened to. They help them to see potential and steadfastly work towards their goals. They will be an understanding, supportive force in their child’s life no matter what troubles come. INTP fathers are open-minded, intellectual, and respectful of their children’s unique personalities. They give their children the freedom to explore their many ideas and perspectives without judgment, and they enjoy teaching them and showing them new angles of seeing the world. INTP dads usually need some time to transition between work and home life, and will often take a breather in their rooms before engaging in family life. This isn’t because they don’t care, but so that they can regain energy and show their best selves to their family. They greatly need alone time and can become stressed when they have to jump back and forth between work and family quickly. When they do interact with their children, they are usually playful, imaginative, and good at storytelling. INTP fathers enjoy when their children argue their perspectives and stand up for their opinions. They don’t like conflict, but they enjoy seeing their children’s independence and ability to think for themselves. They are usually less bothered by this than many other types, in fact it can make them proud. When it comes to discipline, INTP dads are usually not very strict or controlling. They know discipline is a part of training and that it has to be done, but they usually review each circumstance on a case-by-case basis to see if it’s necessary. INTP dads can struggle with parenting when their time is over-scheduled, they have to attend many social events or parent-teacher conferences, or when they can’t get the alone, free time they need to unwind. Overall, INTP fathers are skilled at helping their children explore new perspectives and pathways of thought. They are accepting and easy-going, allowing their children the freedom to find their own identity and principles. They give their children quiet support and steady teaching to get through the ups and downs of life. INFP fathers believe in giving each of their children the freedom and empathy to explore their own identity and values. They are compassionate, imaginative parents who know how to step into their children’s shoes and see where they’re coming from. They are open-minded and enjoy having the freedom to talk about their children’s many ideas, read fairytales and fantasy stories, and spend time with them in nature. They greatly enjoy storytelling, reading books with their children, and finding creative ways to spur their imagination. They are usually not especially strict, unless something violates their values. Honesty and kindness are usually values that they hold very dearly and they will expect their children to adhere to these the most. INFP fathers need alone time and can struggle with the noise, commotion, and social nature of parenting. They will often need some transition time between work and home life so they can recharge before interacting with their children. They can also struggle with the nitty-gritty details of parenting; chores, working on repetitive homework, and other practical demands can feel stifling to them. It’s important that their time isn’t over-scheduled and that they still allow themselves some quiet time for reflection and thinking. When they’re allowed time to recharge INFP dads are extremely attentive and playful with their children. Overall, INFP fathers are wonderful at inspiring their children’s imagination and eye for possibility. They are empathetic and caring and will provide gentle support and loyalty whenever their children need them. ENTP fathers are playful, imaginative, and enthusiastic parents. They enjoy talking and interacting with their children, exploring their many ideas and teaching them about new concepts and perspectives. More than anything they enjoy seeing their children go after their dreams, talk about their fantasies, and question things for themselves. They are usually energetic and spontaneous and like the opportunity to drop everything and go on an adventure with their children. That said, they also like their own freedom and will need some time to engage intellectually with other adults, and experience new situations and ideas independently. They are good at encouraging independence in their own children, and try to teach their kids to be self-sufficient and confident in their abilities. They will do this by teaching their children, giving them challenges, and not hovering over them when they’re trying to learn something new. ENTP dads can struggle with the routine and details involved in parenting. They don’t like having the same schedule day after day, and they dislike having to constantly focus on practical chores and household projects. If they can get some of their own time regularly this shouldn’t be much of a problem though. 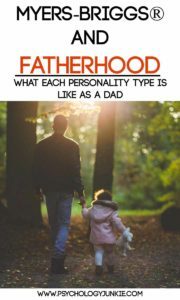 Overall, ENTP fathers are “big picture” people who will show their children options and possibilities that will inspire and motivate them in life. They are great teachers and enthusiastic listeners who will affirm their child’s imagination and independence. ENFP fathers are experts at fostering their children’s imagination and sense of wonder in the world around them. They love to give their children the freedom to explore their own value system, their own ideas, and their own path in life. They get their greatest joy from hearing their children’s imaginative stories and perceptions, and they rarely (if ever) will put a damper on their children’s dreams. They are very interactive and playful with their children and enjoy long conversations and creative endeavors. Where ENFPs struggle is with the mundane details and chores involved with parenting. They dislike routine and the repetitive aspects of homework and household chores. They also need time to themselves now and then to pursue their own passions and ideas. They can feel overburdened if they are constantly shuffling between work and family and social engagements and not able to stop and reflect on their own values and thoughts. When it comes to communication, ENFP dads are empathetic, conceptual, and full of ideas. They like brainstorming with their children and seeing their own skeptical, independent nature come forth. They foster independence in their children and are anxious to see them form their own unique identity. Overall, ENFPs are imaginative, open-minded, nurturing dads that will teach their children to see the world from new and varied perspectives and to see possibility and potential everywhere. What have your experiences been as a father? Do you have any input or suggestions to add? Leave your thoughts in the comments!